Building envelope solutions: A system of asphalt-free, elastomeric, liquid applied coatings that form a seamless barrier to the construction of cavity walls. Air barriers minimize air leakage through building walls, preventing premature degradation from air and moisture damage, and resulting in energy savings due to decreased heating and cooling costs. Air barriers contribute to a cleaner, healthier interior by offering resistance to a host of indoor air contaminants including dirt, algae, bacteria and airborne pollutants. Air barriers are versatile enough to protect virtually any new structure, making them well suited for single family and multi-story residences, schools, libraries, medical and government facilities, commercial and retail space and office buildings. When used in conjunction with compatible accessory products and other building components, air barriers provide flexible, continuous and gap-free coverage to the building envelope. AIRMAX 2102 is a high-performance, solvent-based liquid-applied air barrier and vapor barriers designed for walls on commercial buildings. TK Products 2102 was designed to be applied in cold temperatures without the need to tent the building or using propane heaters. AIRMAX 2102 has the industries best UV-Resistance (12 Months) and allows for a seamless air and vapor barrier. 2102 is an ideal air and vapor barrier for medical, educational, and multi-family buildings, along with training and simulation centers for the Army Corp of Engineers. 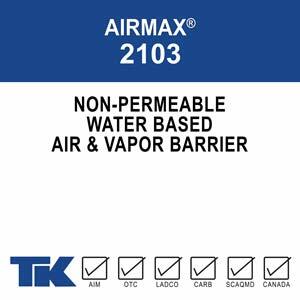 AIRMAX 2103 is a water-based, <100 g/L, non-permeable, rubberized air and vapor barrier ideally suited for residential building and commercial cavity walls. TK Products 2103 has superior UV resistance for 12 months and can be applied at temperatures 40 degrees and rising. AIRMAX 2103 will help your building envelope resist algae, bacteria, alkalis, acids and degradation from freeze-thaw cycles. 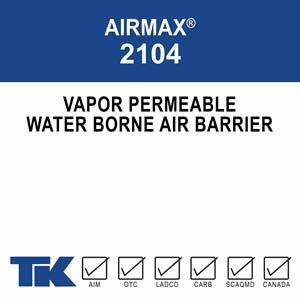 AIRMAX 2104 is a waterborne, <100 g/L, liquid applied, seamless, vapor permeable air barrier that creates a tough film for protecting air leakage (infiltration & exfiltration). TK Products 2104 will retain maximum flexibility throughout multiple weathering-cycles and will repel wind-driven rain, while still allowing unwanted moisture to escape. AIRMAX 2014 flexibility allows it to move with the substrate through a wide range of temperatures making it the preferred air barrier for bridge cracks on residential and commercial cavity walls. AIRMAX 2105 is a solvent-borne, <100 g/L, silicone based, vapor permeable, a liquid applied membrane that acts as an air and weather barrier. TK Products 2105 is rated for cold-climate application at temperatures of zero degrees and rising. AIRMAX 2015’s air and weather barrier can be applied to residential concrete, masonry, exterior gypsum, plywood and OSB boards and protect them from air leakage (infiltration/exfiltration). Climate Tech – Weather Resistant System offers superior flexibility, elongation and recovery properties which allow it to effectively bridge cracks and move with the substrate throughout a wide range of temperature. Climate Tech applies directly to the surface and permanently adheres for protection that will not shift or blow off in high wind conditions. TK Products Climate Tech System will form a tough, seamless and uninterrupted film that will help reduce the amount of energy needed for heating and cooling and comes with a 10 Year Warranty for Trained Installers. 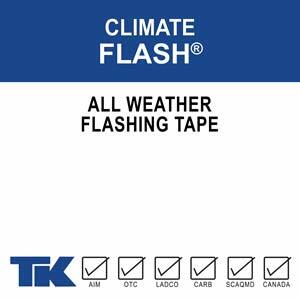 Climate Flash is an all-weather flashing tape is a multilayer polyolefin backing that acts as an air, moisture, and vapor barrier. Climate Flash is self-adhering, self-seals, and will conform to irregular surfaces with low permeability. 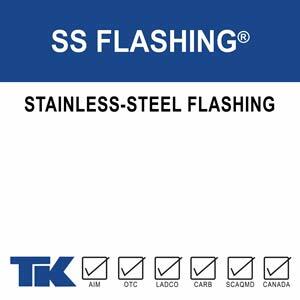 SS Flashing is a self-adhering stainless-steel lap/splice material designed to work with TWF-18™. SS Flashing will form a tough, watertight bond and aid in preventing air transmission through masonry, curtain walls, construction joints and fittings. Super Seal PE is an elastic moisture curing sealant with superior adhesion when used in metal architecture, curtain wall construction and joints subject to movement. 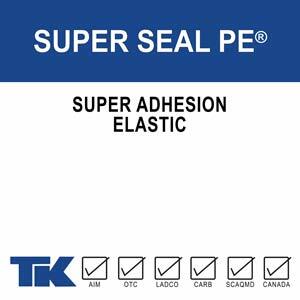 TK-Super Seal PE will not shrink, is non-slump, and can be applied vertically and overhead. Super Seal PE is paintable within 24 hours and is permits the use of anodized meatal and coatings such as Kynar 500® PVDF. 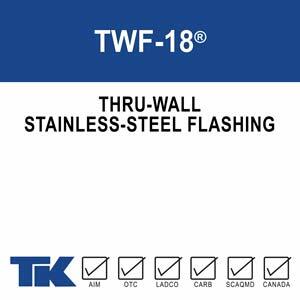 TWF-18 is a stainless-steel flashing designed to collect water in wall cavities and redirect it to the exterior of the building. TWF-18 is tough, durable, resists corrosion, mold, and fire and will help prevent costly water damage and deterioration of the building envelope. Mold, mildew, rust, energy-loss, structural deterioration—the list of problems facing air and vapor barrier technology is long and disastrous. From the foundation up, every phase of creating the building envelope puts construction materials to the test of powerful natural forces: water, wind, temperature changes, climate events and UV light. Among protective coatings for the building envelope, fluid-applied air and vapor barrier products are the most versatile and adaptable. Referred to by Green Building Advisor as “housewrap in a can,” these liquids provide all the levels of protection offered by rigid materials, while their fluid-based application keeps pace with the frequently-changing and time-pressured scheduling inherent in creating large buildings and complexes. 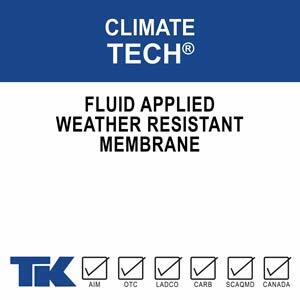 TK liquid air and vapor barriers offer planners and contractors the wide range of choices needed to regulate and restrict air and water vapor migration, from mediation of flow to prohibition. Products comply with national and major regional VOC standards. Easy application (spray, roller or brush) and short cure-times bring TK reliability and continuity to a wide variety of environmentally-demanding situations. Compatibility with other building products and systems and thoroughness of coverage in demanding situations mean that TK air and vapor barrier products excel in versatile solutions for both new construction and renovations. Construction is a constantly dynamic process. Structures don’t just sit there. Any building not actively going up has begun the process of coming down. Critical to managing this dynamism is the use of materials that protect the integrity of the building envelope throughout its lifetime.